"When is peace tougher than war?" Forty-five million light years from here lie NGC4038/9, two colliding galaxies that, in the far future, give rise to two galaxy-spanning civilisations, the Shango and the Qareen. Yet with mutual power comes mutual distrust, and so the inevitable happened: the Intersection Wars, a brutal series of conflicts which devastated large swathes of both galaxies and shifted the balance of power in both galaxies. Yet in peacetime, it appears that the challenges are greater, and the political narratives less straightforward. As well as holding together a tentative truce and alliance, the Shango and the Qareen must deal with terrorist factions across their respective galaxies, contentious and extreme movements, the upstart newcomers that are the Stoppan, the sinister conundrum of the Bhoot Republic, and the ambiguity and godlike power of the Dharans. The Galactic Series has not been tagged yet. 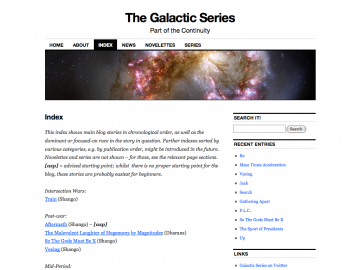 Help others find The Galactic Series by tagging it! The Galactic Series has not been reviewed yet. The Galactic Series has not been recommended yet.